Acer has taken the idea of building your own PC to a whole new level with its new Revo Build M1-601. Resembling an Intel NUC, the Revo Build is a modular computer that lets you click together different parts like Lego to add functionality. 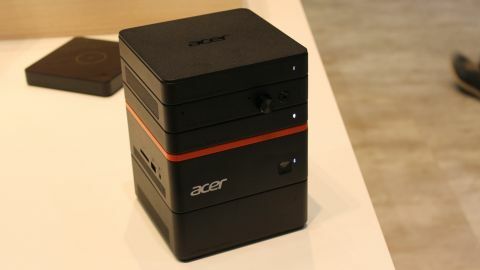 Acer is pitching the mini desktop PC at people g who don't want to go as far as building traditional tower PC from scratch but seek an entertainment machine with higher level of customisability than what's available to buy today. The brains of the operation is a 1 litre chassis that measures 125 x 125mm, making it around the size of an Intel NUC or Mac Mini. It bears zero resemblance to Acer's 2015 Revo One RL85, which is more compact and one of the more stylish pint-sized computers around but lacks customisation features. The base unit comes with an Intel Pentium or Celeron processor with integrated HD graphics, all backed up by up to 8GB of DDR4 RAM that can be upgraded by loosening a single screw. Blocks can be placed in any order and are connected using pogo pins on on the top left-hand edge. The magnetic action lets the blocks come together in a literal snap, and just enough force is required to prize them apart. You could accidentally knock the Revo Build over and the blocks would stay in place. Acer is launching several hot-swappable blocks at launch, including 500GB or 1TB portable hard drives. Acer told me that they will be followed by a wireless power bank for charging and an audio block for speakers and microphones in the future. The Revo Build's endless possibilities makes it an intriguing device, and one that could even cater for gamers in the future if Acer manages to squeeze something along the lines of AMD's R9 Nano GPU inside. On the back of the Revo Build's base unit are a number of ports, including HDMI-out, two USB ports, power and an ethernet connection. It wouldn't be crazy to think that a block offering further expansion capabilities such as Thunderbolt or Displayport would arrive in the future. The Acer Revo Build M1-601 will be available in the UK mid-October starting at £199.99 (around US$303). There's no word yet on US availability, or how much individual blocks will cost in the future. Acer has produced one of those "how didn't anyone think of that earlier?" moments with the Revo build, which looks to do a great job of removing the complexity from building a PC. It may not pack the power of desktop PCs such as Apple's Mac Mini or Intel's NUC, but its upgradability ramps up the appeal for anyone seeking a machine with a longer lifespan down the road.